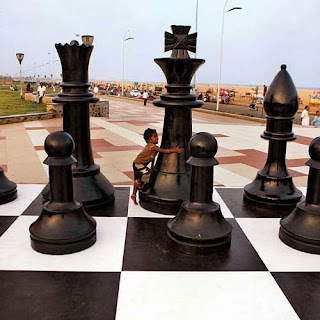 The match between Viswanathan Anand, current title holder, and Magnus Carlsen, challenger, for the world championship of chess is being played in Chennai, India, on the subcontinent where the game was born, circa 600 AD. If you didn't know this match was happening, you're not alone. 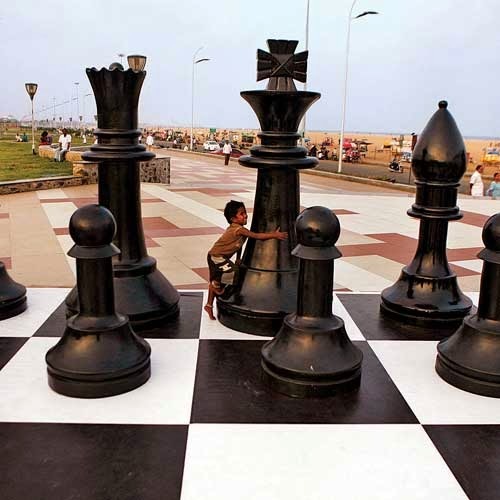 Perhaps you'd be in a minority in Norway, where the young, charismatic and telegenic Carlsen was born, or in India, where Anand is now a folk hero. But if you were from, say, Philadelphia, it might not even have occurred to you that Bobby Fischer was more a acclaimed American chess player than Marlon Brando. The one thing that can be said for sure about game one is that Carlsen (age 22) did not wear out Anand (age 43). 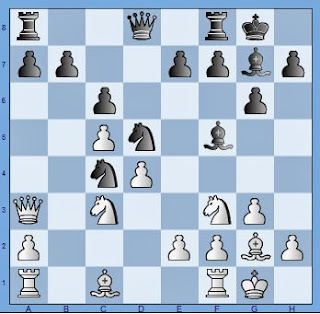 It ended in a draw by virtue of repetition — three consecutive moves leading to three identical positions — after less than an hour and half, which is next to nothing in chess time. It was concluded in sixteen moves — thirteen if you subtract the repetitions. Obviously, Anand and Carslen didn't really come to fight. The analogy might be to a boxing match where the combatants put up their hands, throw a few to work up a sweat, and say, hey, this was really cool, see ya around. Except, to stay with the boxing analogy, this was round one of the chess match. 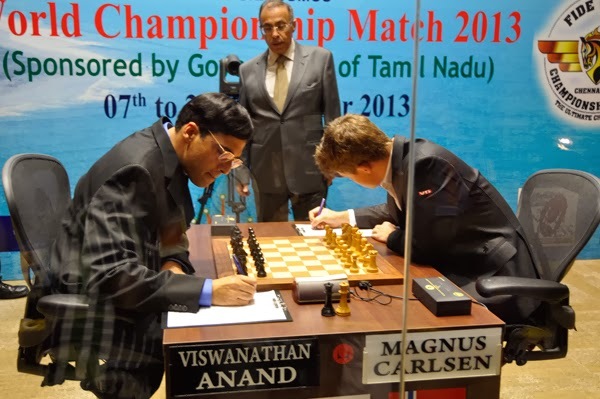 It's best of twelve games, so Anand and Carlsen will be back in the ring eleven more times. Anand, playing black, always at a disadvantage, can take some comfort in his easy first game draw. Get some rest tonight, Viswanathan. Carlsen will be white in the next game. He will come out swinging. He will be subtle and elusive, and just maybe really cool. I do not expect him to lay down for a draw. Maybe Garry Kasparov, once Carlsen's tutor — think Cus D'amato in re Mike Tyson — will say: Yes, Magnus, yes! Or maybe he'll say, Magnus, you shoulda stopped with the video games when I told ya, and listened.